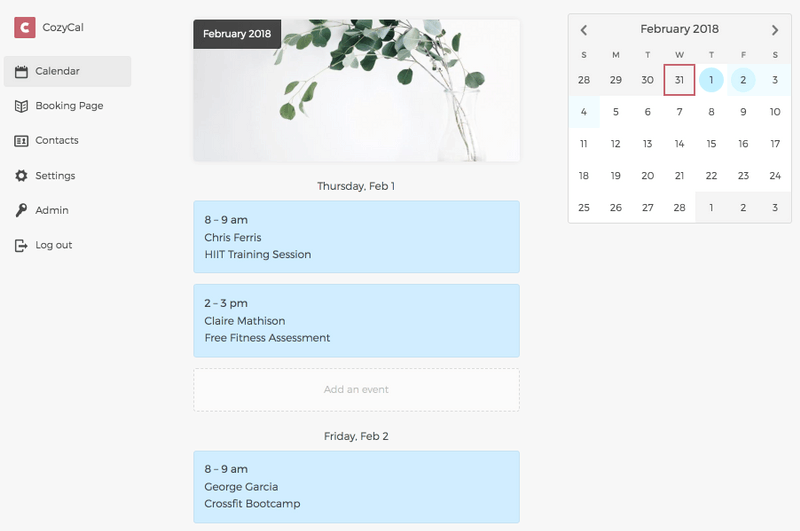 Simple, beautiful booking pages. CozyCal is the easiest way to integrate appointment scheduling in your website. User friendly. Responsive customer service. Clean appearance. Pros: Ease of use and it's appearance. From the user (biz owner's POV), it's SOO easy to use. Set up was a breeze. Integrating it to the website was easy. From the customers appearance (those who visit my website to schedule), it looks every clean. The font is clean, the layout is clean and makes sense. Cons: The occasional bug that does not allow us to add additional times. After adding new times, the cozy cal calendar (navigated from the website) has these new appointment times missing (not present). Overall: Stream-lined patient scheduling. That easy. Overall: This is a nice tool. It's mostly for gmail/google calendar users, but fortunately that's most people these days. Easy to manage, great customer service...got an appointment 15 mins after installing it!! Pros: The easy of use of this plugin is incredible. Also I like the interface and not to mention the customer service is super fast in responding and taking care of all my questions. Cons: The compatibility with iPhones....not working on WP platform but customer service is working on solving the issue! Overall: Not only is CozyCal beneficial to me and my staff, but also the patients who are looking to schedule appointments. It is very clear on how to use and maintain the site. We have a few problems with broken links, however it is not to say that CozyCal is a bad software. Whenever we need help, their support team is quick in response and friendly. This software has helped our business grow by letting patients schedule themselves and sending us notifications of schedule changes. Thank you CozyCal! Pros: Cozycal automatically sets up a meeting with our website visitors. It offers some great options to customize the branding, input forms and emails. It also takes away the headache of figuring out the different time zones. Overall: Easy to use scheduling system that allows efficiency with our business. Clean and modern design and interface allows for a professional experience. CozyCal is easy to setup and has a great modern look that was simple to integrate into my website. Pros: The key feature I was looking for was a quick & simple integration with my Google calendar and Cozy Cal delivers. CozyCal is free to get up and running and functional, very important for startups that aren't sure how much online scheduling will be used but want to offer it to clients as an option. Cozy Call was simple and easy to integrate into any WordPress or any other kind of website. The widget is modern looking, color customizable and can be made to blend in with almost any website theme. Cons: The only thing I can think of that would be nice is the ability to have a scheduling page instead of always a floating widget. Some HTML or embed code that I could copy and paste into my own page and then I can link to it from anywhere for direct access, say from an email signature link. Overall: Quick & simple Google Calendar integrated Online Website scheduling tool. Great app, lets me stay connected to my boyfriend and were never left wondering where each other is. Pros: The ease of use of entering events, the colours, simple design and layout. I love the whole concept because my schedule is always full of stuff and always chabging so I can keep my partner updated on what Im doing or where I am. The plugin was easy to install and quite easy to implement into my company's CRM system. Pros: I like the quick and easy to follow installation the most about this product. Other calendars capable of integrating with google calendar usually contain many ads and restrict access to key basic features. Cons: I wish that more was included in the free package, but then again the amount a month is completely worth the additional features. Pros: How well the software if bundled, and the consistency of the configuration. There is no extra garbage added into the WordPress installation outside of scope. Cons: Integration between different calendar systems and multiple sites; there are a lot of calendar tools out there, but none seem to provide that. Pros: This software is very user-friendly both from the administrators side as well as from the customer side. Cons: We have found that some other schedulers are a little more customizable than this one, but other than that this one is extremely efficient. Great support and super easy to use! Pros: Great user experience on both ends, backend linking works perfectly! Ease of use is super smooth. Highly recommend. Cons: Hard to track with google analytics. I was trying to track how many booking I'd get. But was unable. Cons: Wish I could get notifications .. texts.. when people make an appt. If my business grows.. would like a plan for under a certain amount a month. Pros: It's a good product and I'd use it again. It is easy to use once it's setup and instinctive. It also looks good. Cons: I did not find setting cazycal up easy. It is not very instinctive, for me. I really have no other issues. Pros: Clean UI, use it in my email signature, lets clients book their own sessions with me without me needing to be there, syncs with Google Calendar. Cons: Some times updating the app and our current schedule can take a bit of time. Good! Small learning curve. Integration complications in unique scenarios. Pros: It worked straight out of the box with Wordpress. My client was easily able to customize the backend the way they wanted. Cons: Complications when doing custom styling on the boxes made it difficult to achieve the look my client wanted. Overall: Easy scheduling assistance for my client and quick software setup and testin on the backend. It's very easy to use with friendly interface. Pros: Friendly interface with clean layout to both read and review for users. As a web site admin, backend design is also very easy to use. Plus, integrated with Google account made it super-easy for user to fill out any type of form. Cons: I need less appointments and MORE than one service per month for the FREE plan. If services grew lager than 3, that's the time to considering purchase monthly plan. Overall: Clean cut of layout design. It's the best in the class. Used it for a bit, but stopped. Pros: Customers can make appointments directly through my site. I don't have to do the work myself of talking to them and manually putting it on my calendar. Great tool for small business! Pros: So easy to use and install. User experience is seamless both user side and admin side. Highly recommended. Cons: Not everything can be free ;) nothing really. Overall great product. Just wish it was free but great product. Product did exactly what it said it would, easy to use. Pros: It works very well, Seamless and easy to use. I love that it integrates wit wordpress and did not cause any issues or clash with any other plugins.